CrazyLister is a cloud-based eBay listing management solution which provides users with the tools to create professional, mobile-responsive and 100% compliant eBay listings. Incorporating a drag-and-drop editor, customizable templates, and eBay compliance management tools, plus bulk design revision functionality, CrazyLister aims to simplify eBay listing creation and management. Designed to be accessible for everyone, CrazyLister’s intuitive editor allows users to create new listings and edit live listings without needing any coding knowledge. CrazyLister offers over 200 professionally-designed eBay templates, which can be customized using the drag-and-drop editor. Users simply select a template, then add, remove or customize it as much or as little as they want. CrazyLister also supports a mobile listings editor and mobile responsive templates, to ensure that listings look great on any device, from desktop to mobile. Another important CrazyLister feature is bulk design revision which allows user to apply the same design to hundreds or thousands of listings in seconds. Bulk design revision ensures that any active content is replaced immediately by a fully eBay-compliant design. Overall Crazylister is very easy to use. You can easily create templates and use them for all of your eBay listings. I have been using since this was a free service and it's got a lot better. They also follow eBays TOS and listing practices which continually change. Hmmm, well to start I don't like how they go about pricing. They were posting 3 of their logos in every listing. This looks crazy.. Then they charge you an extra money to remove their logo.. I have run into quite a few headaches using crazylister and have reached out to them, but they never seem to care that they are costing me money. They always refer you to some pre-written article that doesn't help.. If you change your description at all on eBay it will conflict with Crazylister and not display the same on mobile. Also, if you change your product listing to another product (reuse the listing) you could be in for a nightmare as I was a few months back. eBay required everyone to start using SSL descriptions so I updated the templates on Crazylister and all of my listings reverted back to the first description (reverted to an old product) without my knowledge which caused me many headaches. And of course they have no way to contact them via phone so you have to wait for them to message you back.. again usually pre-written responses. My overall experience with CrazyLister has been very positive. It has allowed me to design a very professional Listing Frame for my eBay account. It is easy to make changes, and to create a library for future Listings. It will allow me to expand my eCommerce efforts into additional product lines (professional Listing Frames customized for each), and eventually I will be able to expand to additional sites.I wanted a software Listing Tool that would allow me to customize my eCommerce Selling on eBay. I had previously used 2 other services (Auctiva and SixBit), but after using them each for at least a year, would finally get frustrated with their poor Customer Service: my questions rarely got answered, or were answered with a pre-canned response that did not directly answer my initial question. At CrazyLister, I was impressed with how quickly somebody would get back to me with an answer to my questions. This was a VERY dramatic difference from my previous experiences. I have received the same great Customer Service several months after starting service with CrazyLister. They have been very helpful. I wanted a software Listing Tool that would allow me to customize my eCommerce Selling on eBay. I had previously used 2 other services (Auctiva and SixBit), but after using them each for at least a year, would finally get frustrated with their poor Customer Service: my questions rarely got answered, or were answered with a pre-canned response that did not directly answer my initial question. At CrazyLister, I was impressed with how quickly somebody would get back to me with an answer to my questions. This was a VERY dramatic difference from my previous experiences. I have received the same great Customer Service several months after starting service with CrazyLister. They have been very helpful. Overall the CrazyLister Service is very good 4.5 Stars out of 5 Stars), but like any software product, there are some minor areas which I would like to see improved. This involves editor options for Listings - no capability to color text is 1 example. In the Listing Frame area which is very easy to use, I would again like a little more flexibility to create clored "boxes' (zones with color - no border), but could not accomplish that. Overall their system is very good compared to others that I have previously used. The only major surprise was that I could not see my frame via "HTML" in CrazyLister, which I would have liked, so that I could make some minor tweaks to the overall Listing Frame - again, an editor issue. Overall my experience with CrazyLister has been outstanding. It has decreased the time it takes me to post new items to eBay, has helped me to improve my processes regarding standardization of content and process management, and has made my listings look better while being much easier to navigate which has increased sales. The highly personalized and professional looking templates also attract more customers and have helped to highlight my brand/store.The website is easy to use, has a lot of great functionality, and makes selling on eBay very simple for people who don't have the time or energy to create their own professional looking listing. There are a ton of features with new ones being released all the time and they seem to all comply with eBay's continually changing T's&C's. Plus, the templates are very clean and easy to apply and edit. It's certainly made my side business much easier to handle in terms of time management and efficiency! The website is easy to use, has a lot of great functionality, and makes selling on eBay very simple for people who don't have the time or energy to create their own professional looking listing. There are a ton of features with new ones being released all the time and they seem to all comply with eBay's continually changing T's&C's. Plus, the templates are very clean and easy to apply and edit. It's certainly made my side business much easier to handle in terms of time management and efficiency! While a big "Pro" of CrazyLister is all of the features and large catalog of templates, it can also be a little overwhelming for those just getting into the process of selling on eBay. As such, the learning curve can be (at least in my experience) high initially. Until I really got in and started digging into all of the settings, the sheer amount of options available certainly led to some "overload" frustration. Crazylister is very easy to use, and they are constantly improving their platform. Now with the new upgrade, I cane edit, sync and all my listings under one roof. Before the latest upgrade i had to keep swapping between eBay and Crazylister. Now I can sync my listings and the most important one for me is the save and revise. No more choosing what listing template to revise. This eliminates revising wrong listing, I am sure that most of us has done that before, especially if you have quite a few listings. Yep! The new upgrade is by far, the best yet. I can't imagine how you could improve on what you have already, considering you have to play by Ebay rules and guidelines. The new upgrade is fantastic, just like opening a new Xmas present. having the choice of editing eBay listing information in one place has sold me to continue my subscription. Save and revise without choosing template eliminates mistakes (Fantastic). Has become more idiot proof. You don't have to be an expert anymore. Customer service excellent. The new upgrade is fantastic, just like opening a new Xmas present. having the choice of editing eBay listing information in one place has sold me to continue my subscription. Save and revise without choosing template eliminates mistakes (Fantastic). Has become more idiot proof. You don't have to be an expert anymore. Customer service excellent. Had to play with the mobile version for a bit to get it right Apart from that insignificant thing I have no cons. 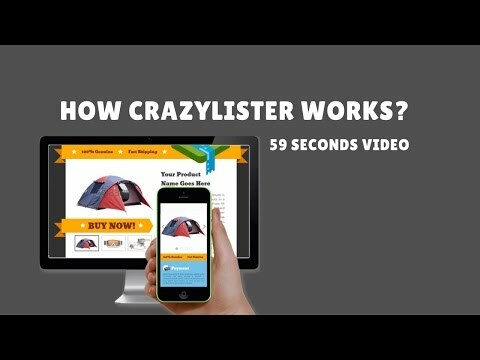 CrazyLister fits to any eBay business size, from beginners to large sellers. CrazyLister includes over 200 professionally-designed eBay templates that users can select and customize. Supports an eBay cross selling gallery which is compliant with eBay’s 2017 active content policy. The drag-and-drop editor allows users to add, remove or customize template elements without requiring any coding knowledge. The mobile listings editor helps users create eBay listings which are fully optimized for mobile devices. Bulk design revision functionality allows users to apply the same design to hundreds or thousands of listings, in a single click. Below are some frequently asked questions for CrazyLister. Q. What type of pricing plans does CrazyLister offer? Q. Who are the typical users of CrazyLister? Q. What languages does CrazyLister support? Q. Does CrazyLister support mobile devices? Q. Does CrazyLister offer an API? Yes, CrazyLister has an API available for use. Q. What other apps does CrazyLister integrate with? Q. What level of support does CrazyLister offer?